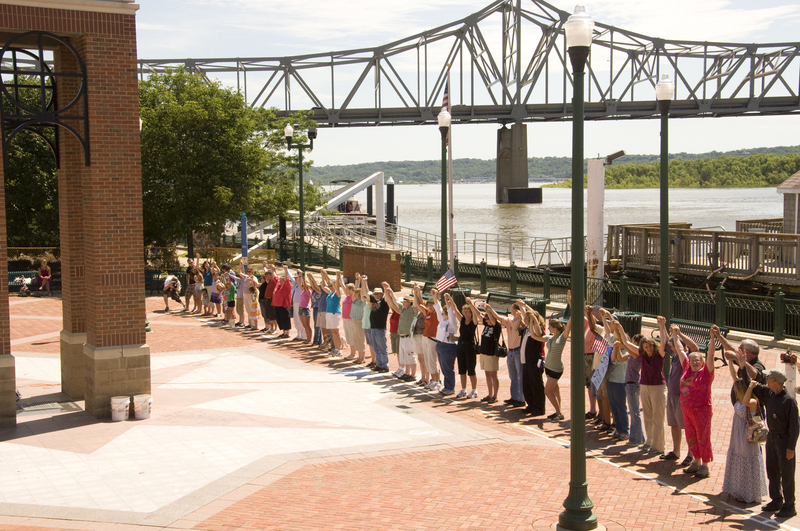 On Saturday, June 26, area residents at the Peoria riverfront joined people across the globe gathered at their local beaches and riverfronts to draw a line in the sand and say “no” to offshore drilling and “yes” to a clean energy future for America. Gatherings were organized in all fifty states and numerous countries around the world. The global web site, www.handsacrossthesand.com, recounts the origins of the event as well as its vision and goals. National sponsors included Sierra Club, Audubon, Defenders of Wildlife, Greenpeace, 350.org, moveon.org and 42 other groups. Locally the event was hosted by the Global Warming Solutions Group of Central Illinois, Peoria Families Against Toxic Waste, and the Heart of Illinois Sierra Club.